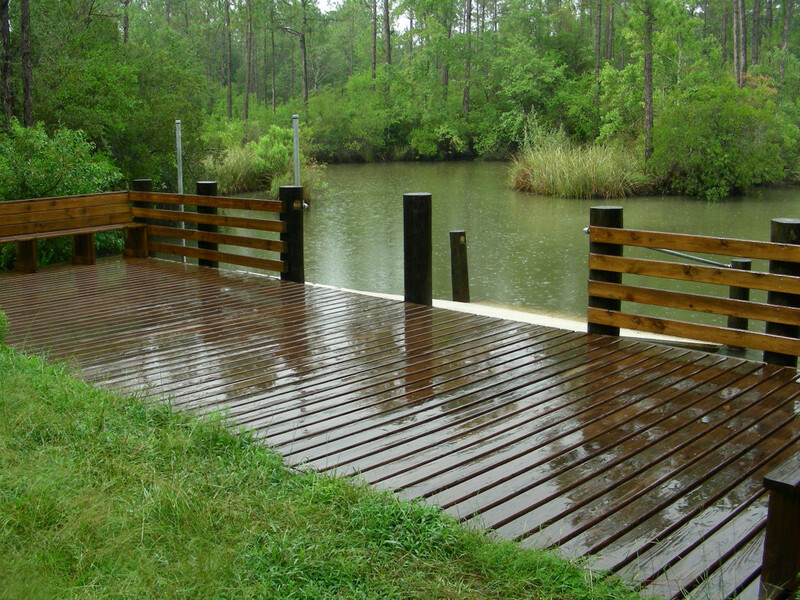 A shower falls at the Graham Creek Nature Preserve canoe launch, great paddling weather! Heading out from the canoe launch on a rainy day. The channel is narrow and winding. You can't miss the entrance to this amazing little preserve in Foley, Alabama. Graham Creek is a remarkable 4-mile out-and-back paddle that snakes its way through a fascinating tidal marsh of mixed hardwoods and pines and offers paddlers a chance to float with alligators, dolphins, and maybe even a manatee. This is a fairly easy paddle with a low current. While you're welcome to paddle with your dog remember there are alligators on the creek. Keep your pet in the boat and out of the water. While in south Alabama, don’t miss the chance to dip your paddle in the serene waters of the beautiful Graham Creek in Foley. This remarkable 4-mile out-and-back paddle begins at the Graham Creek Nature Preserve and serenely flows down the park’s namesake creek that feeds Wolf Bay and eventually the Gulf of Mexico. The creek twists and turns its way through a fascinating tidal marsh of mixed hardwoods and pines and offers paddlers a chance to float with alligators, dolphins, and maybe even a manatee. Red-Tailed Hawk soar overhead and blue grosbeak, loggerhead shrike, and many other birds serenade you from the banks. A beautiful, serene paddle awaits you along Graham Creek in Foley, Alabama. 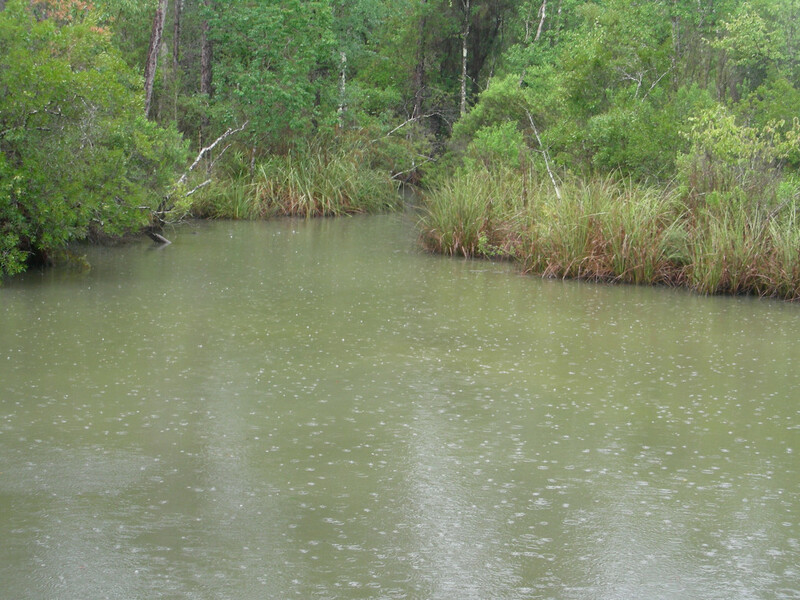 From the put-in the creek rambles 2-miles southeast where it feeds Wolf Bay and eventually the Gulf of Mexico. The winding creek flows through a magnificent forest of mixed hardwoods and pines and a tidal marsh. The marsh offers paddlers a chance to float with dolphins and maybe even a manatee or two. As the creek snakes its way southward you may glimpse an alligator just under the surface of the water or sliding off a bank. Remember to keep dogs and children out of the water. Hundreds of varieties of migratory birds fly-in during the spring and fall giving birders an opportunity to add to their lists. The put-in for this trip is at a floating launch at the Graham Creek Nature Preserve. The channel is narrow here and very peaceful. From here it slowly widens as it heads toward the bay and as it does so you’ll want to paddle along the south bank of the creek. The north side will eventually be lined with houses and piers and is prone to significant motor boat traffic. At the 2-mile mark the south bank of the creek juts northward forming a little peninsula and as you round it you will find yourself with an expansive view of Wolf Bay. This is where you turn around and head back to the put-in. The current isn’t too strong so you should have no trouble making it back. Both novice and seasoned paddlers will love exploring the creek and its narrow side channels. It is the perfect place to simply float serenely and unwind through a beautiful forest and tidal marsh. The creek is a prime location for birders who want to add to their list of birds they have spotted. And for those of you visiting the area and looking for something to do besides hitting the Gulf beaches, the creek's close proximity to Gulf Shores and Orange Beach makes this the perfect getaway from the crowds along the shore. From Foley, Alabama, at the intersection of US 98 and AL 59 take US 98 east 2.1-miles. Turn right onto the Foley Beach Expressway and follow it south 3.6-miles. Turn left onto CR 12 South and travel 1.3-miles and turn right onto Wolf Bay Drive. 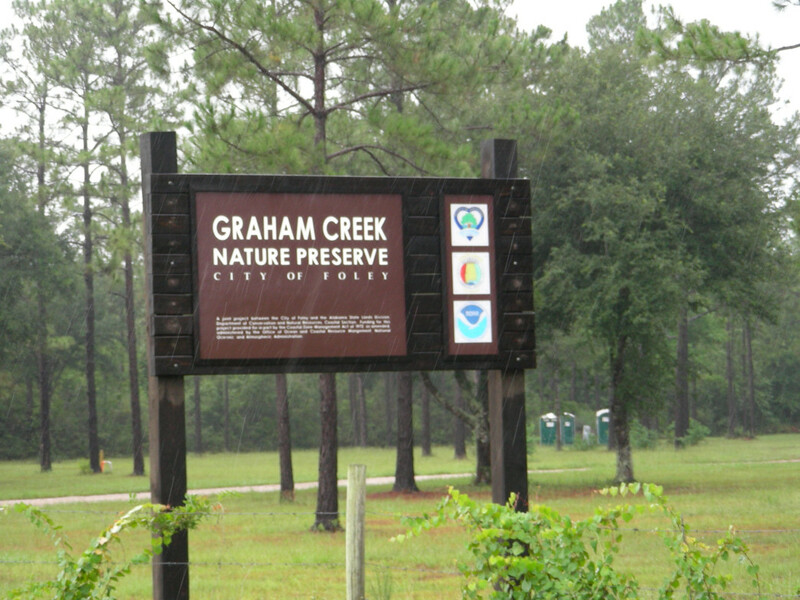 Travel 1.0-miles and turn right into Graham Creek Nature Preserve (the entrance is well-marked). Head south into the preserve and travel about .25-miles to the parking area. The canoe/kayak launch is only a few yards to the south of the parking lot. While they are not always seen, alligators do swim in these waters. Keep children and pets out of the water.